The next steps described below will give you a overview as to how the data recovery exactly works. Please keep in mind that you can always contact us in our Support Center should you face any difficulties recovering your deleted emails. Run Recover My Email by clicking the desktop icon or selecting Start > All Programs > Recover My Email. Then select File > Open Email Data File, or click the icon. 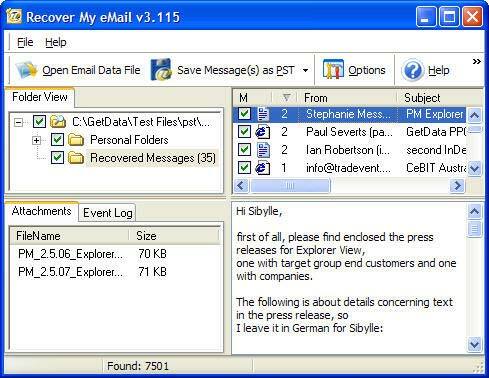 Navigate to the copy of your Outlook.pst or Outlook Express.dbx files. If you have not already made a backup copy of the files you can make one here using the right mouse click 'copy' and right mouse click 'paste' function. Once you select the required file, click 'Open' the file will automatically process. Recover My Email does not change the contents of the email file being searched. At the completion of processing you will see the results screen. 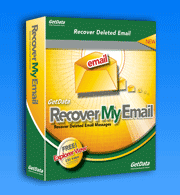 Recover My Email shows both your 'active' email and any deleted mail messages that can be recovered. The left hand Window contains the folder structure (Outlook only). Navigate through the folders to look for your deleted messages. The top right hand Window contains the message properties, such as 'To', 'Recipient' and 'Subject' (note that messages can be sorted by clicking on column headings). Click on a message in the top window to show the contents of this message in the bottom preview window, as shown below:. If a messages content is displayed in the message preview window then the message and it's attachments, if any, can be recovered. If the content of a message cannot be previewed then it cannot be recovered.